On the last day of fashion week, my first show of the day was KTZ at 3pm so I spent most of the morning looking around the show rooms and viewing collections from previous shows close up as well as discovering new designers. 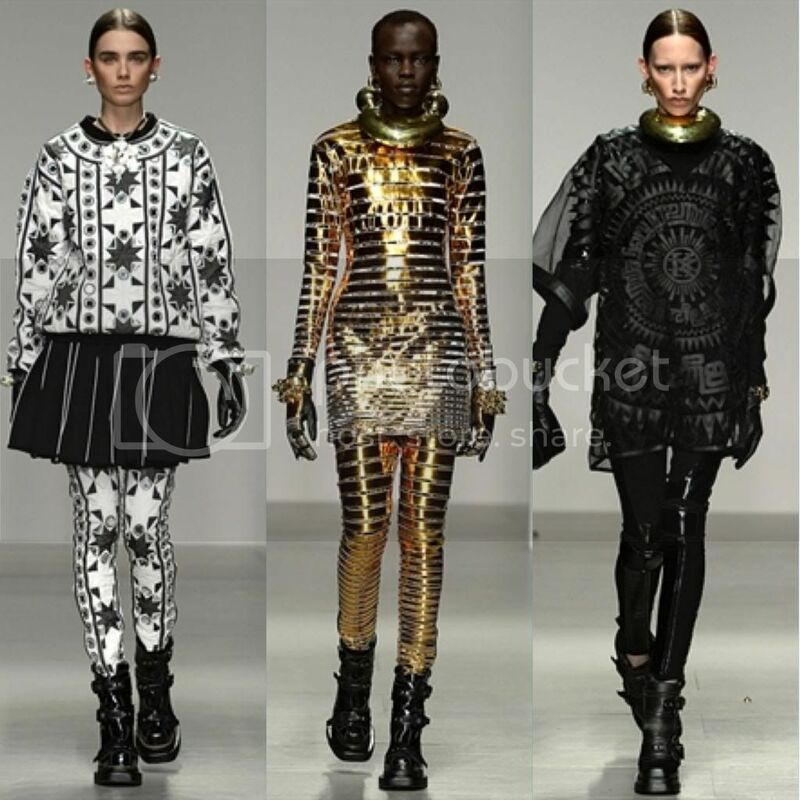 The KTZ show is always exciting to watch and has become extremely popular due to the likes of Rihanna, Rita Ora, Kanye West and Jay Z regularly donning the brand. This was my second time attending the show and as always the queue was ridiculously long but once in I took my seat on the second row and got my camera ready. As the show started the room went pitch black, then the first model emerged onto the runway to the soundtrack of the Ying Yang Twins and Missy Elliot. The world of KTZ is always intriguing as urban contemporary styles are fused together in an east meets west way with patterning and layering. Taking inspiration from the Inuit tribes the collection consisted of white and black with metallic discs and mirrored embellishments intricately sewn onto chiffon, silk and wools. Pieces included a variety of drainpipe trousers, oversized jackets, fur ponchos, leggings, pleated skirts, fitted dresses and hooded bomber jackets. The addition of huge statement necklaces, bangles, earrings and metallic panelled gloves set the collection in a futuristic way. KTZ once again proved to be the master of texture clashing! My favourite piece was the last model in a full gold suit, bold tribal necklace and gold gloves....edgy yet chic and ahead of our time! Design sisters Tamara and Natasha Suguladze definitely pushed the boundaries and brought something new to fashion week and their collection for Tata Naka. 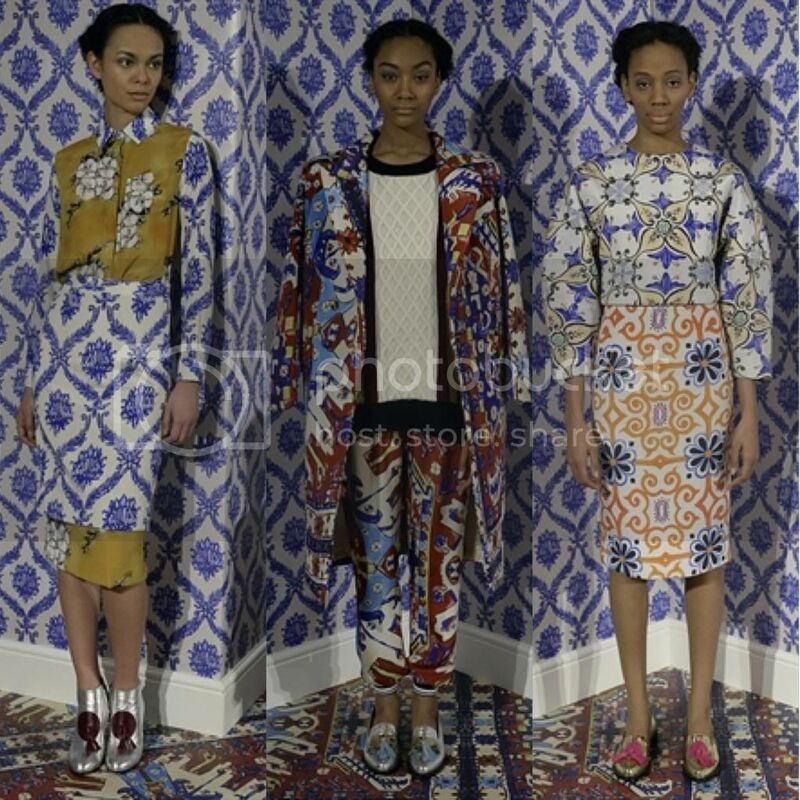 Drawing inspiration from interior design in particular Persian rugs, Aubusson carpets, ceramic tiles and porcelain china, the collection was heavily patterned, with differing prints put side by side in a technique influenced by Matisse paintings. 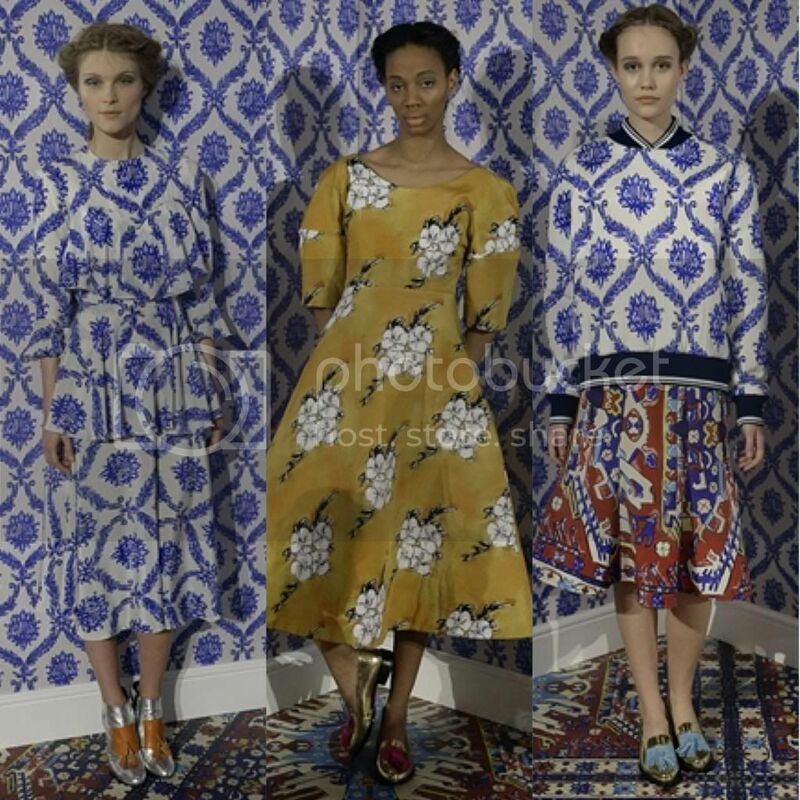 And the inspiration was definitely evident as models literally blended in with the seriously loud wall paper at the presentation but not in a solemn way but in a shocking awakening your system on the last day of fashion week way. The collection presented a quirky vintage vibe as the aesthetic of prints, appliqué and shapes were displayed onto georgette, silk neoprene and wool crepe. The models worked printed trousers, skirts, dresses, tops, and coats against colour block separates. Finished off with metallic brogues and boots completed with quirky hot pink tassels, this was a smart collection combining the love of vintage with clean lines that will certainly play up to the ladylike trend in AW14.